...that the Covenant produced an AI capable of thinking for itself and betraying its masters? This article is about the book. For the Halo Channel feature, see here. The Halo Encyclopedia: The Definitive Guide to the Halo Universe is an official guidebook of the Halo universe, published by Dorling Kindersley and created in conjunction with 343 Industries. The encyclopedia has a foreword written by Frank O'Connor, head of 343 Industries, with Tobias Buckell editing. The cover of the book was illustrated by Craig Mullins. The original edition of the Encyclopedia was released on October 19, 2009. 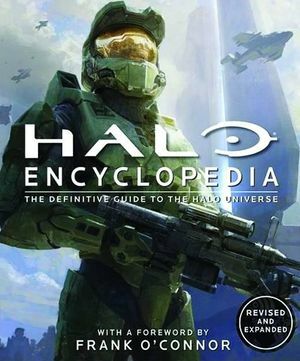 An updated edition of the Halo Encyclopedia with an extra sixteen pages (including information on Halo: Reach) was released on September 19, 2011. The Halo Encyclopedia begins with a foreword by Frank O'Connor. It then introduces the Master Chief, the Covenant and many other aspects of the Halo universe. Chapter One contains a timeline (complete to publication), followed by chapters on humans, Spartans, the Covenant, the Flood, the Forerunners, the Human-Covenant War, science and technology, transport, locations and finally weapons - before a glossary of terms, index and acknowledgements. Reception to the Halo Encyclopedia has been mixed. Some reviewers and readers praised the book's detailed approach to its content. However, other reviewers stated that the book's images are often of poor quality and "at times seem haphazardly thrown together." Others criticisms centered on the work's poor editing, most notably its poor spelling and grammar. Misattributions are also frequent, with the Scout and Rogue armor being referred to as one armor type. Later printings of the Encyclopedia feature improved editing, eliminating many mistakes that exist in the initial printing, including several mislabelings and misattributions. Nonetheless, several factual inaccuracies remain. For example, the ranking system of the Brutes is mangled, with a picture of a Major labeled as a Minor, and the color of an Ultra's armor is mis-cited as cyan instead of violet. The Encyclopedia splits the Battle of Earth into a "First" and "Second" battle, a decision originating from Halopedia, until newer information from Halo: Ghosts of Onyx and Halo 3: ODST established that the battle was in fact one continuous engagement. Another error has even had impact on the series canon outside of the Encyclopedia itself: the book mentions a faction of Insurrectionists named the "United Rebel Front" or "URF"; this name originated from Halopedia, which had mistakenly interpreted the descriptive term "united rebel front", mentioned in Ghosts of Onyx, as a proper name. In addition, the rebel destroyer Origami is designated "URF Origami", which is also based on an earlier version of the ship's Halopedia article; no previous official source mentions the rebels using such a ship prefix. Even though Halopedia later corrected this mistake, the misunderstanding persisted and led to the United Rebel Front being integrated into newer works of official fiction. The Secessionist Union and the People's Occupation Government are stated to be the same organization, a claim clearly originating from Halopedia, as the original source for the two groups does not indicate they are synonymous. Shield World 006 is referred to as "the Sharpened Shield", which was a short-lived fan-given name for the installation on Halopedia. The 2011 edition incorporates new content, mainly image assets, from Halo: Reach, as well as correcting some of the mislabelings in the original. However, many of the errors remain. 343 Industries Content Creator Jeremy Patenaude has acknowledged that many of the errors remain in the new edition, and stated that future efforts to create a Halo universe encyclopedia would be rewritten from the ground up. The revised Encyclopedia still refers to the "First" and "Second" Battles of Earth instead of the "Battle of Earth" only, an error that came from Halopedia. The erroneous terms "Covenant Loyalists" and "Covenant Separatists" are used to refer to the participants of the Great Schism. This terminology also came from Halopedia. On page 10, it is said that the Prophet of Regret's failure to invade Earth caused the Heretics to lose faith, while Halo 2 clearly showed the Heretics had rebelled because of 343 Guilty Spark's revelations on the Halo Array. On page 33, it is said the Odyssey colonized the first Inner Colony in 2362—supposedly Reach. Though the vessel did spearhead the first wave of colonization, it seems Reach itself was not the first colony world. This may be a misinterpretation of the original Xbox.com timeline. On page 36, Cole's Pyrrhic victory over the Covenant at Harvest is stated to have occurred in 2531, though it took place in 2526. The Encyclopedia may have mixed this up with another, less important engagement in which Cole participated in 2531 over Harvest. On page 36, it is said that SPARTAN-III Beta company Team X-Ray disappeared in Zone 67, Onyx, in 2537, while they went missing in the year 2539. On page 43, it is said Odyssey was sent to colonize Reach in 2310, instead of 2362. The front cover is adapted from a piece of Halo concept art.